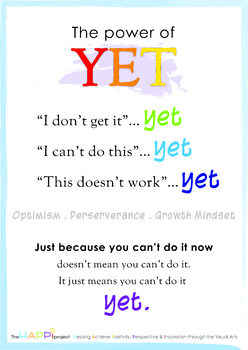 Motivational poster working with the Power of YET wording. Illustrated to decorate your classroom. Designed to print up to A3. We love to share and would appreciate your ratings and comments as 'payment' for this free Poster. Thank you and be HAPPI. The HAPPI Project is an initiative to promote and encourage creativity and optimism through the Visual Arts. Helping Achieve Positivity, Perspective & Inspiration. Ultimately we would like to create a visual arts program which allows accessibility to young people who may not otherwise have this opportunity. To achieve this we will start by encouraging positive messages through artworks encompassing inspirational quotes, sayings and or relevant messages.